“Know The Stars And You Will Always Have A Compass”. In a survival situation, whether at sea or on land, the chances are you may have nothing to navigate by other than the stars in the sky. Finding the Direction of North. The Pole Star (otherwise known by various names including Polaris, North Star, Lodestar and the Guiding Star). As the Earth rotates, the Pole Star, which is almost exactly in line with the Earth’s celestial north pole, does not change its position in the sky unlike the other visible stars. For this reason, it will always indicate the direction of north. The trick is to find the Pole Star in the sky and for this we need the help of the following constellations of stars. 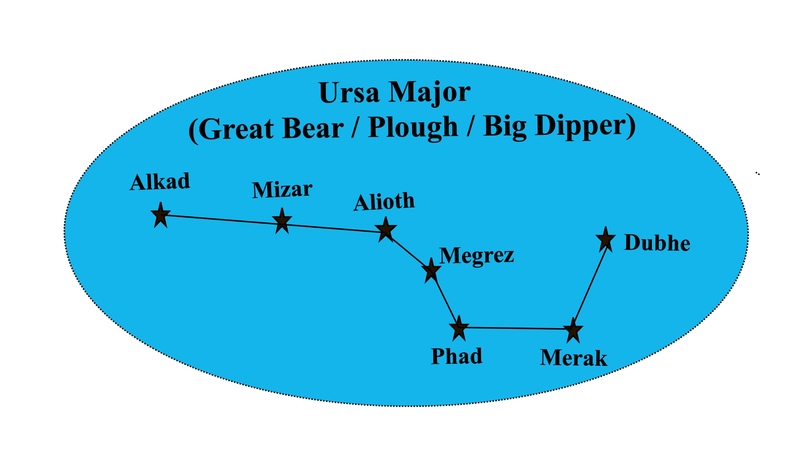 Ursa Major (also know n as The Big Dipper, the Plough or The Great Bear). The best known and easily recognizable constellation in the northern hemisphere is the constellation Ursa Major which is also known by various other names such as the Big Dipper and the Plough. Ursa Major is a circumpolar constellation which means that it rotates around the celestial north pole and never sets below the horizon. It is visible all year round in the northern hemisphere and in northern regions of the southern hemisphere. Ursa Minor (also known as the Little Dipper or the Little Bear) contains Polaris, the Pole Star. Ursa Minor is also a circumpolar constellation and it can be seen throughout the northern hemisphere and as far south as 10oS. Using Ursa Major and Minor to find the Pole Star. As illustrated in the diagram below, Ursa Major contains a reference line known as the line of pointers. The line joining Merak to Dubhe, when extended, will point to Polaris (the Pole Star) which is in the constellation Ursa Minor. Polaris is not a particularly bright star although it is the brightest star in Ursa Minor. Cassiopeia. The Queen. 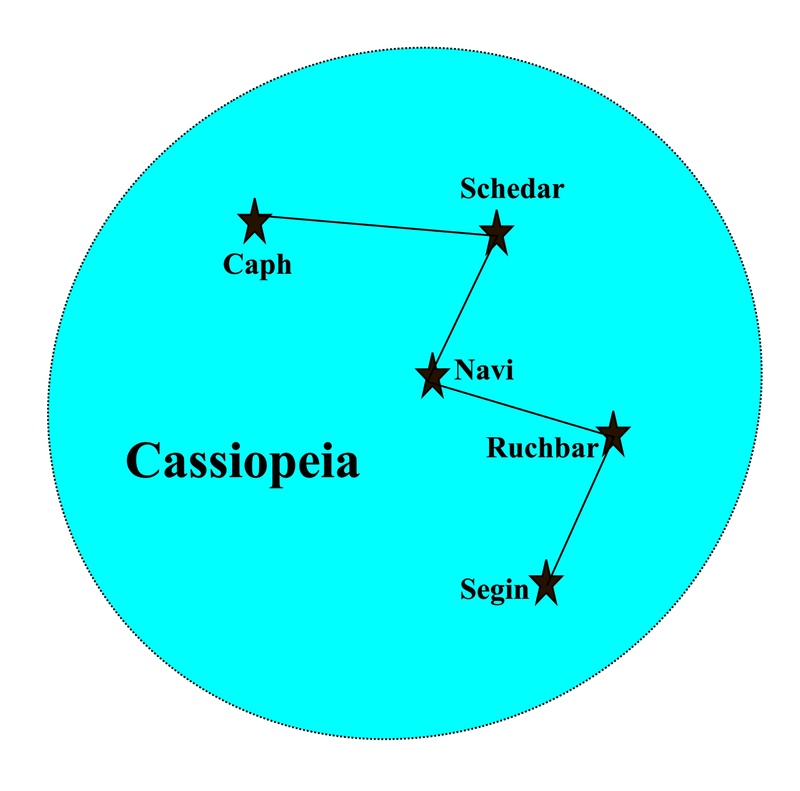 Cassiopeia is another circumpolar constellation; it is quite easy to find because of its ‘W’ shape which sometimes hangs upside down as it circles the north celestial pole. It can be observed throughout the northern hemisphere and down to 20oS. 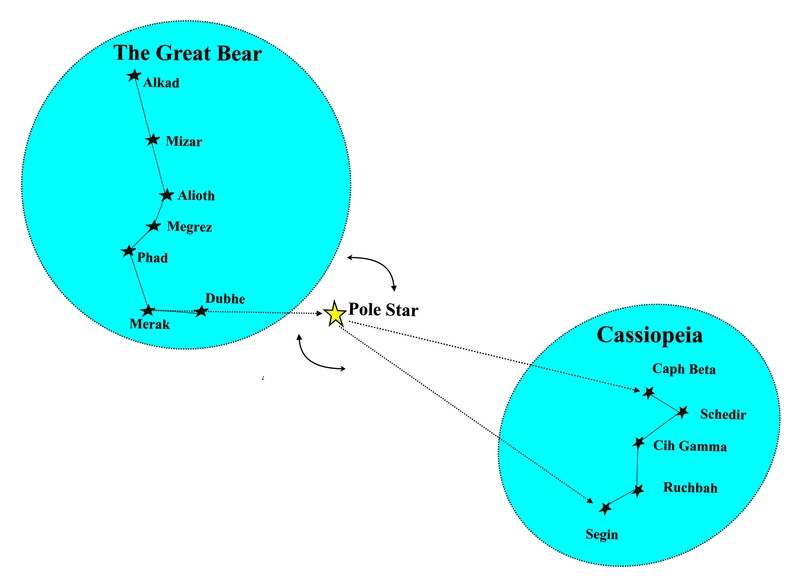 The star Segin which lies in Cassiopeia can be located along a line of reference from the Pole Star at an angle of 135o to the line of pointers in Ursa Major as the diagram below shows. As Ursa Major revolves around the Pole Star, so do the five stars of Cassiopeia with Segin always keeping its position 135o from the line of pointers. Knowing that the Pole Star always lies between these two constellations provides us with a further way of finding it. Finding The Direction Of South. The Southern Cross (the constellation Crux). Crux (Latin for cross) it is one of the smallest constellations in the sky but also one of the brightest. It is not visible north of 20°N in the northern hemisphere but it is circumpolar in the southern hemisphere south of 34°S which means that it never sets below the horizon there. Acrux, the brightest star in the cross. Palida has variable levels of brightness. How to find the Southern Cross. 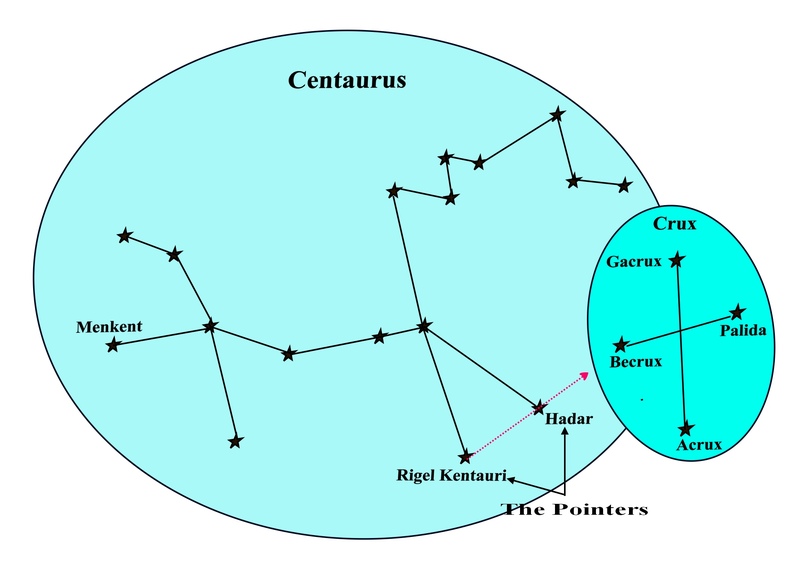 The constellation Centaurus contains two bright stars which make excellent pointers to help us find the Southern Cross. The Pointers as they are known, are Rigil Kentaurus and Hadar. 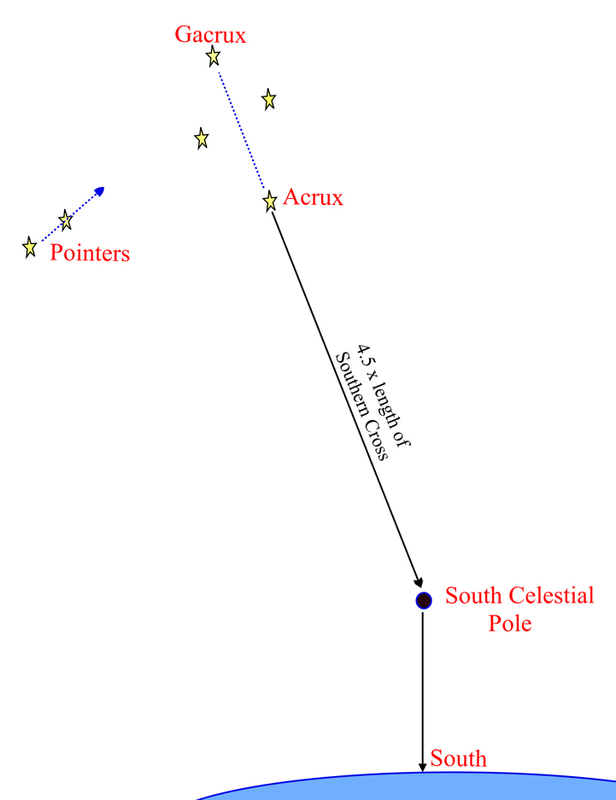 of the north celestial pole, Crux does not coincide with the celestial south pole so we have to rely on other methods of using it to find the direction of South. 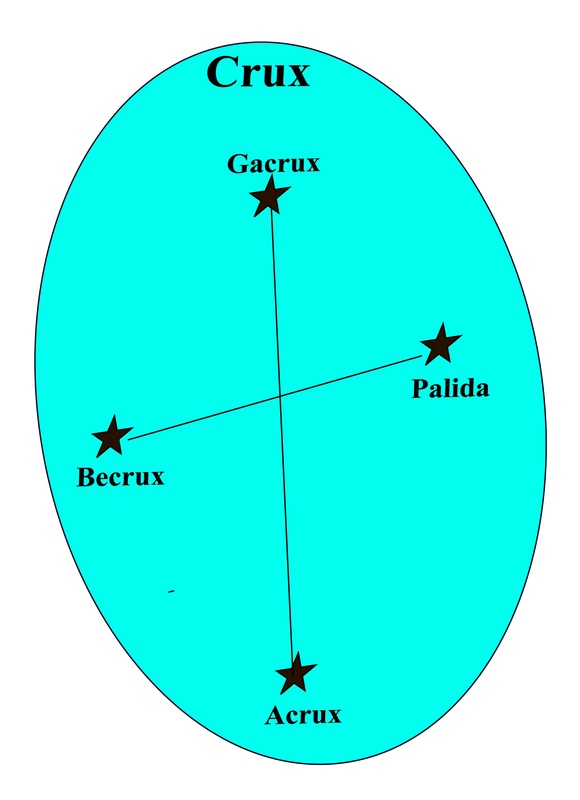 There are several methods but the simplest is as follows: Make an imaginary line between Gacrux and Acrux then extend this line from Acrux (the brightest star) for 4.5 times the length of the Southern Cross, as shown in the diagram below. This will take you to the position of the South Celestial Pole in the sky. From the South Celestial Pole, drop a line down to the horizon. Where this line touches the horizon is the direction of south. Finding The Directions Of East And West. There will be times when neither the Pole Star nor the Southern Cross can be seen for various reasons. However, this need not be a problem, for if we can find east or west, we can find north and south. Fortunately, there are at least two constellations that can help us in this respect. Orion, The Hunter This easily recognized constellation straddles the celestial equator and for this reason, it always rises in the East and sets in the West. 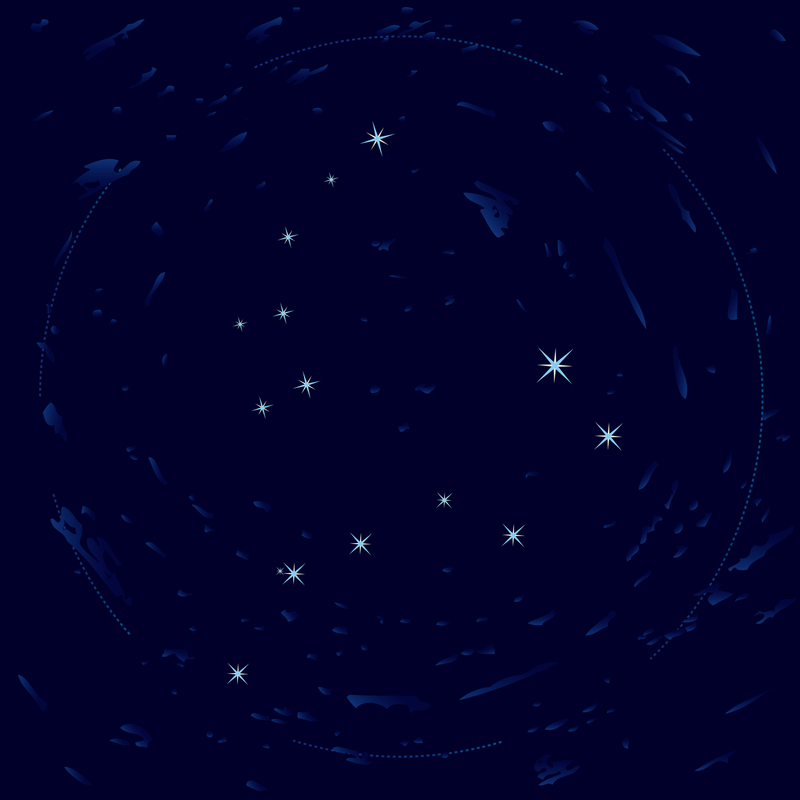 The stars Alnitak, Alnilam and Mintaka form the belt of the hunter and are easy to find. Alnilam which is the middle star of the belt and the brightest of the three is almost exactly on the Celestial Equator so it will always rise at due east and set at due west. The bright red star Betelgeuse will rise first and this will give you a warning when Alnilam is about to rise. After Orion has risen it moves across the sky in an westerly direction following the Celestial Equator and so, by noting its position at intervals, we can gauge the direction in which it is moving and so find east and west. Orion is a Winter Constellation. This means that it is only visible in the night sky during the northern hemisphere’s winter months (summer in the southern hemisphere). During summer in the northern hemisphere, it is above the horizon during daylight hours so we cannot see it. However, all is not lost; we have a summer constellation which can help us to find east and west when ‘Orion is asleep’. Aquila, The Eagle. 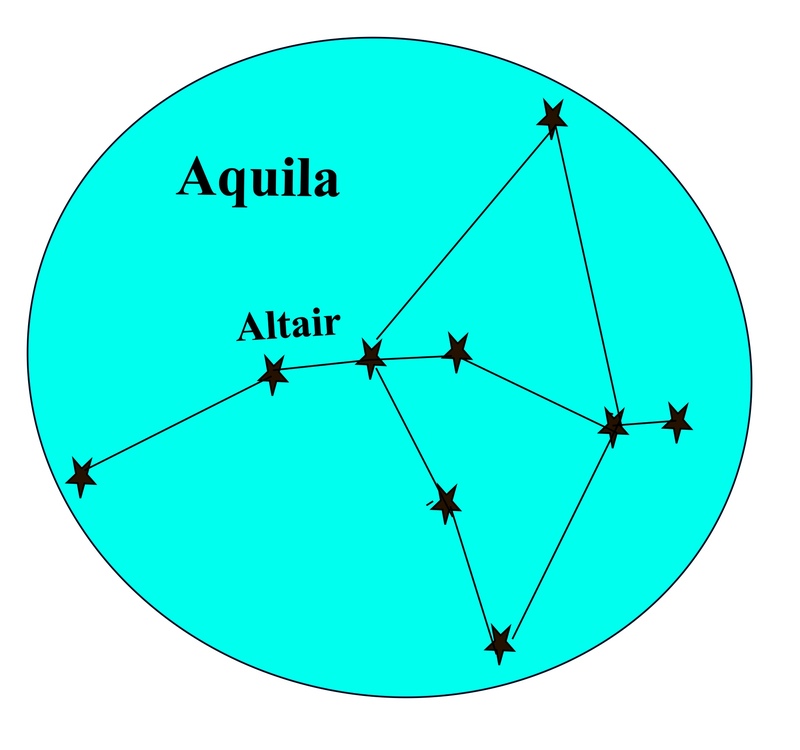 Like Orion, Aquila sits astride the celestial equator and its brightest star, Altair, rises very slightly north of due east and sets just north of due west. During the northern hemisphere’s summer, Altair takes the place of Alnilam and becomes our guiding star to the directions of east and west. How to find Altair. 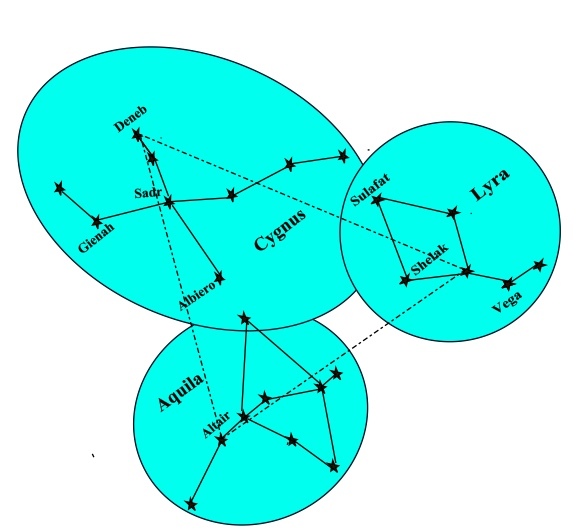 Together with Altair, the stars Deneb in the constellation Cygnus, and Vega in the constellation Lyra form an astronomical asterism known as the ‘Summer Triangle’ which is formed by imaginary lines drawn between those stars as shown in the diagram opposite. As well as being an important navigation aid in its own right, the Summer Triangle helps us to easily find Altair which can, in turn, help us to find the directions of east and west. This entry was posted in astro navigation, Astro Navigation Topics, astronomy, celestial navigation, navigation, Survival and tagged astro navigation, celestial navigation, navigation, survival, survival - navigation. Bookmark the permalink.